The Ahmadiyya Muslim Youth Association (AMYA) will be hosting their flagship event, the ‘Mercy for Mankind’ 10K Charity Challenge, at 10am on Saturday 16th April.The run has taken place since 1985 and raises around a quarter of a million pounds every year.AMYA has about 500 young members from Epsom, Tolworth, Sutton, Surbiton, Worcester Park, Carshalton and Maldon Manor. Around 600 runners will take part in the event, which will be attended by MPs and community faith leaders.This will be the 31st Charity Challenge, an event which has raised more than £2 million for various UK charities including Barnardoʹs, the British Heart Foundation and Great Ormond Street Hospital.The organisation’s young members in southwest London alone raised £34,000 last year and are aiming to raise £40,000 this year. 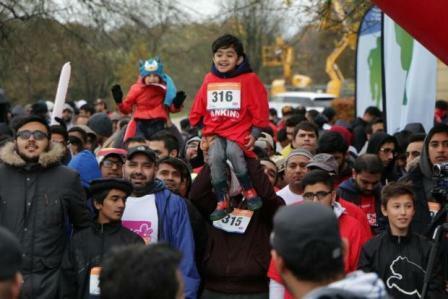 Share the post "Young Muslims from the Ahmadiyya Muslim Youth Association to raise money for Barnardoʹs, the British Heart Foundation and Great Ormond Street Hospital in 10K Hyde Park run"